Streamlining and style isn't something that's usually associated with action cameras, which is a surprising since the average extreme sports enthusiast looks for cool and style as a matter of course. The iON Air Pro 3 is a sleek styled and solidly made action camera that differs greatly from the boxy but feature packed style of the GoPro Hero. The streamlined form enables the camera to sit far more discreetly on a vehicle or helmet and is less prone to being knocked out of place. iON has chosen a one piece design which, unlike the Toshiba Camileo X-Sport, GoPro Hero4 or Sony AZ1VR doesn't require a waterproof housing to protect it from water. This one piece design limits the waterproofing to 15m compared to 40m with the GoPro Hero (when it's within its waterproof housing), so while the Air Pro 3 is a good choice for surfing, the depth is limited if you want to take it diving. The iON Air Pro 3 has a one-piece design that means you don't need a separate waterproof housing, though this limits its maximum depth. Footage and stills are captured by the 12 million pixel sensor which is fronted by a fixed focus, (1m), 160-degree field of view lens. This gives the footage the typical ultra wide action camera look. Controls on the iON AIR PRO 3 are limited with a power button and a sliding switch that starts the camera recording. On the back of the camera is a WiFi on button, and this is mounted on an interchangeable back that once removed reveals a USB port, HDMI, 3.5mm audio socket, micro SD card slot and video quality switch. Unlike the GoPro there is no screen on the camera for adjusting settings. Instead almost all adjustments are made when the Air Pro 3 is connected to a computer or by using the mobile app for iOS or android. There is however a small video quality switch hidden behind the modular back, and this enables you to switch between a high (FHD) and low setting (HD). Up front is a fixed focus, fixed focal length lens with a 160-degree angle of view. Once settings are accessed through the app or on computer. There's a limited selection of options including photo and video resolutions and basic settings such as date and time. The main settings relate to the FHD and HD switch on the back of the camera which can be set to Full HD (1080p) at 30fps/60fps and HD position at 720p at 30fps/60fps/120fps. Exposure, metering, sensitivity and colour are all controlled automatically and there's no option for adjustment. Movies are the most likely use for an action camera but as with the GoPro it is possible to shoot 12Mp stills. There are a few options but if you want to use them then they need to be set through the software. These enable Single Shot, Burst Mode (three shots in a second) and Time Lapse (one shot every 10, 20 or 30 seconds). Wi-Fi is built into the iON AIR WiFi PODZ, which is a separate module that can be detached from the main body. A single button on the back enables Wi-Fi so you can connect to a smartphone via the iON camera app. This enables remote live view for checking the composition, adjusting settings and downloading the footage and stills to a device if you have the space. A helmet mound and adhesive pads are supplied, but other mounts will have to be bought separately. 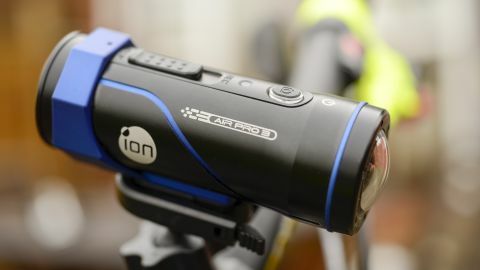 As with most other action cameras the iON AIR PRO 3 features a selection of mounts that can be attached to a variety of different extreme sports equipment. There is a helmet mount and some adhesive pads in the box and further mounts are available but have to be bought separately. These mount options include a board, bike, rollbar, suction cups and more – there's also a remote kit, but again this needs to be bought separately.